I’m waiting for my aging Thinkpad T42 to be delivered today from repair – it had the same fan error as last time, and fortuitously chose the day before my 3-year warranty expired to conk out. My desktop PC replacement saga aside, I need to think seriously about what my next laptop will be – especcially since I can’t renew the extended warranty on the T42 anymore. The T42 is a 14″ machine and it’s basically been the best laptop I’ve ever owned. I have no complaints, and for a replacement the T401s looks like an obvious choice. However, my dalliance with netbooks has me convinced that smaller is better. Unfortunately, netbooks seems to have imploded as a category, I still cant find a decent Core Duo 9-inch netbook with an SSD and Nvidia’s ION2 “Optimus” – and even if I could, I doubt it would come in under the $500 mark (if anyone knows otherwise, though, please let me know ASAP!). However, I’ve become aware of Alienware’s new M11x, an 11-inch laptop which is designed for gaming portability. The smaller size makes it compelling, and it would scream at my scientific work as well as run Warcraft better than anything I’ve ever played on. And it has Optimus and an SSD option (only on the R2 revision, which has the i-series processor instead of Core Duo). The downside is of course that it won’t be cheap, probably $1k minimum if I get a good deal or closer to $2k loaded including 3yr warranty. Thats what I’d be paying for a Thinkpad though as well. I’m going to have stay tuned to @DellOutlet and see if they have any deals on the M11 in the pipe. I’m seriously tempted by it, enough to even consider straying outside the Thinkpad tent. That new X300 is the sexiest laptop on the planet. And you can actually use it to get work done. Sorry, Apple. You’re outclassed on this one. Last week, I started up my trusty Thinkpad T42 and got the dreaded “fan error” message. The laptop performs a fan diagnostic at boot time, and if the fan doesn’t pass muster, it beeps twice and shuts down. You can’t even get to BIOS. The standard solution is to simply replace the fan; my warranty service doesn’t expire until next year so it only took a single phone call and the part was on its way. I decided to ask for the part and attempt to repair it myself on the theory that this would be faster than asking for a mail-in box to send the laptop to them for service. So, in the end I had to put everything back and admit defeat. I have a box from IBM arriving tomorrow for me to ship the laptop back to them. I decided that I’d take out my hard drive before sending the thinkpad in, as I’ve wanted to upgrade for a while now. It was ridiculously easy to remove the hard drive. 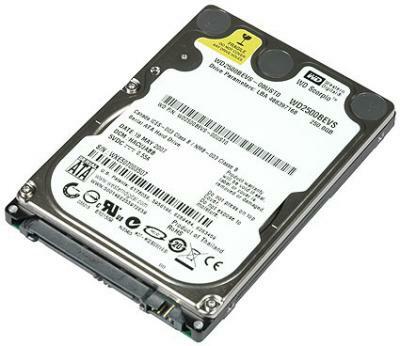 I ordered a new one , with twice the capacity of my old drive (160 GB) but a slower rotational speed (5200 rpm). The low power consumption is the main appeal over competing products from Seagate or Samsung. I’ll dump the old drive in an external case and migrate my data onto a fresh install of Windows XP.